‘Nachom-ia Kumpasar’ was released, it has been making waves, winning awards at international film festivals, national awards, etc. The biggest success it enjoys is that it continues to be screened even today. The film’s actress, Palomi Ghosh, has won the National Film Award – Special Jury Award / Special Mention for Female Actor certificate and special mention for female actor for the role she played. Ever since the film received such a stunning response, there has been one question on everyone’s minds:Did Palomi Gosh ever meet Lorna? Given that Palomi, who hails from West Bengal, did not know the language before this, let alone the song, mastered everything from getting the songs and diction right to her performance in a movie that was deeply rooted in Goan context, there was a curiosity generated about whether she had met Lorna and taken any tips to essay her role. Recently, she performed hits from the film at the May Queen Ball 2018 in Muscat, getting the crowd on their feet with Lorna’s classics. They say imitation is the best form of flattery. But until very recently, Palomi had not got the chance to meet Lorna in person to gauge the legend’s reaction to her performance. 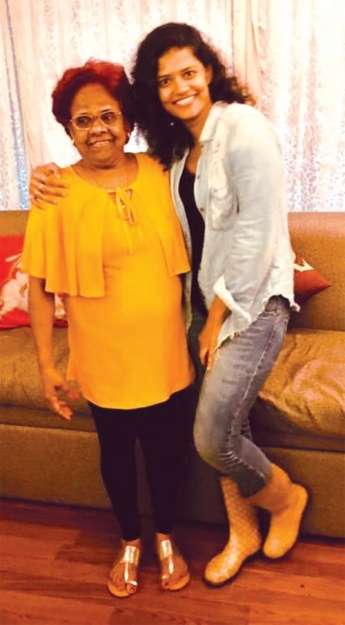 All that changed, when earlier this week, renowned singer Shaistah Thapar arranged for a meeting between Lorna and Palomi and the result of that meeting has since gone viral. Not only did Palomi and Lorna sing ‘Tuzo Mog’ with Thapar joining in later, but Palomi was able to tell Lorna how much she had been looking forward to that moment, adding that she was awestrucknow that she had finally met the living legend in person. With great camaraderie and good music, the videos and posts of this interaction, shared online byThapar, have already garnered a number of likes and shares on social media platforms, including from the director of the film, Bardroy Barretto. Will the two perform a duet together? While we’ve seen many young singers get to perform with the senior artistes whose covers they sing, on the international stage, will Goa also be privy to such a spectacular collaboration? Only time will tell.